Welcome to Day #2 of Chocolate, Smoke and Fire Theme Week. 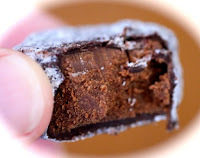 Today's "rookasmooka" from flying noir (Oakland, CA) was a (twice) hand enrobed square, encrusted with Kauai guava smoked sea salt and organic sugar. It was filled with a 70% Amano Ocumare* ganache "with malty rooibos." The overall flavors were sweet and chocolatey, with a very faint smoky finish from the guava wood. The salt and sugar crystals gave this rookasmooka a sparkly snowy, crunchy exterior around a creamy interior, creating an interesting bundle of flavor and texture. 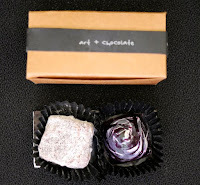 *Amano Chocolate is a chocolate-maker based in Utah. Single origin chocolate (bars) include bars made with cacao beans from the Ocumare region of Venezuela.